"This is Baksheesh (which means 'gift' in the local dialect), a wild dog from Afghanistan we adopted while living in Kabul (age unknown, but likely around 4 months). He had been dealt a bad hand in life up until being adopted by us, having to scrounge for food and water on a daily basis with no pack to support him, and was very quick to take to the good life. 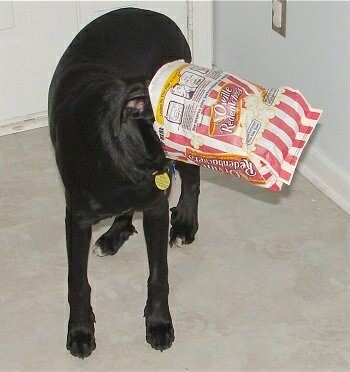 Here he's caught rummaging through the trash to get at the last bit of Cheetos from an empty tin. This is only minutes after he polished off an entire MRE (meal ready to eat), normally used to feed an adult human. I assumed he was making up for lost time on eating, but had to get the photo (and stop falling over with laughter) before dislodging his head from the container." "Willie, our very guilty Basset Hound caught in the act—tearing up a box. “You’re busted!”"
"Here is my Min-Pin Chewy caught in the act! He is a foodie—especially cat food when no one is looking! He is 16 months old in this picture." "This is my dog Tassloff. He is a 4.5-year-old Aussie / Rott mix who was rescued from the side of the road. When I took this pic, I had been out cleaning up my Dad's porch and couldn't play with him, so I put his tennis ball up on the BBQ for a minute. 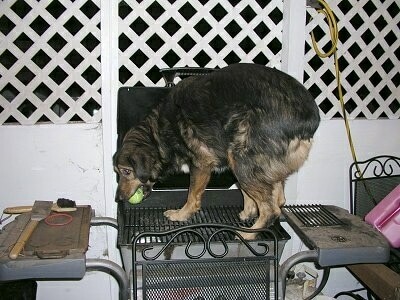 Tassloff climbed the rocking chair next to the BBQ, and then on to the BBQ to get his ball. He is a total nut about playing catch, and will shoot the ball out of his mouth at you until you play with him. Even though he is a little crazy about playing ball, he is SUPER gentle with children, and won't even bump into them when he is running after his tennis ball." "This is the cutest Malti-poo named Daisy who was caught having some fun with our toilet paper. Daisy is a mix from a mommy Poodle and daddy Maltese. She is almost 4 months old and loves to play, especially with paper products. This is not the first time she got a hold of the toilet paper, but at least it was not a full roll like last time. BTW...1 roll of toilet paper can fill a bathroom and hide a puppy." "This is a photo of my Pointer Bay puppy Jake. He was 5 months old in this picture and was found at about 3:00 a.m. making noise in the kitchen. I thought someone was breaking in because I kept hearing something hitting the door in the kitchen. I guess he was rummaging through the trash and got himself in a situation he couldn't get out of...."
"Jake is very active, bordering on wild. He loves people and wants to jump and greet them. He's only 8 months old and already weighs 65 lbs. He's gonna be a real big boy." 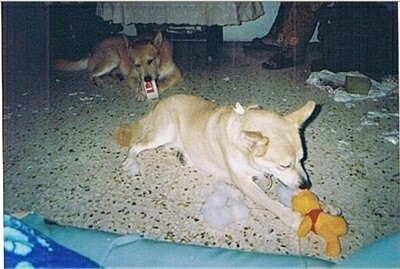 Rudy and Robin,Lab / Husky mixes chewing up a KFC container and soft toy. Rudy, a Lab / Husky mix (Siberian Retriever) about to steal the feather duster! 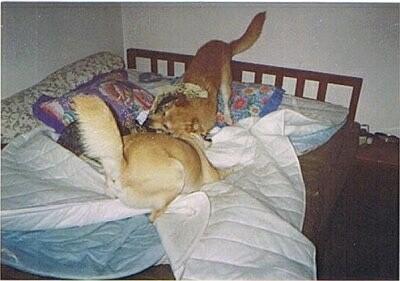 Rudy and Robin, Lab / Husky mixes (Siberian Retrievers), wrecking their owner’s bed! "This is my 1-year-old Kelpie cross German Shepherd Speckles caught sleeping in an unused plant pot in our backyard. (Look at the top right corner to see a colossal overgrown watermelon weed!)"